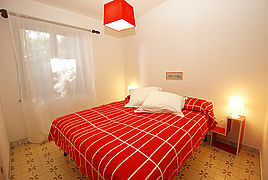 Discount 10% for the travel period 28.02.-30.06.2019 (valid from 28.02.2019). The panoramic view of the Gulf of Policastro counts without doubt among the most beautiful in the Cilento National Park. 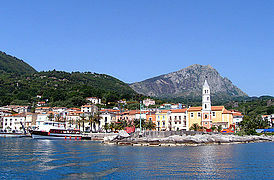 As the small fishing town of Scario is particularly blessed with this vista, it does not come as a surprise that well-to-do families from Rome, Naples and Salerno have chosen Zona Marcaneto above the original town center for their summer holidays between mountains, nature and sea, apart from any hustling and bustling. 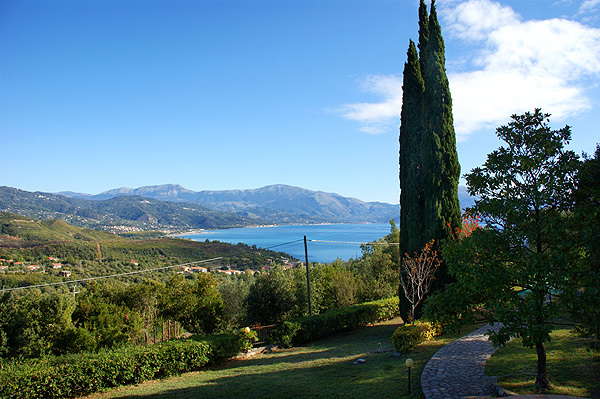 It has developed into one of the most beautiful residential areas along the Cilento coast and that is where family Camajani’s Villa dei Tordi is located. 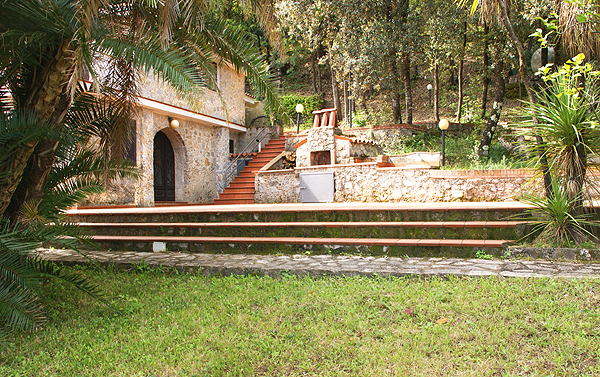 Tordi are the thrushes which live in the woods around Scario and Monte Bulgheria and add their share to making one’s experience of nature in Italy’s second largest national park so unique. 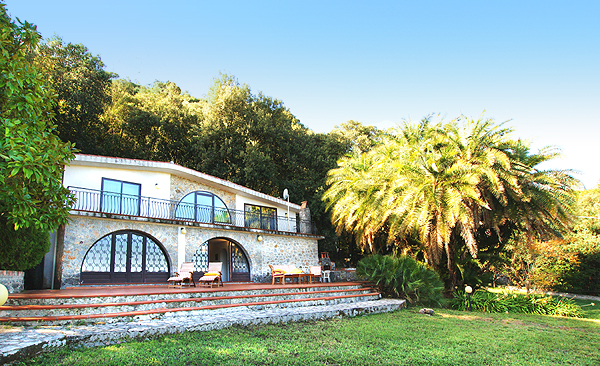 Stately Villa dei Tordi lies embedded in green on completely fenced premises. 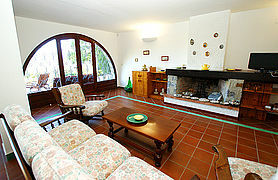 At the 'feet' of the two-storey holiday home with its large (picture) windows facing the sea, the Gulf of Policastro spreads out to form a fantastic setting with the mountains of the neighboring Basilicata region. With its four double bedrooms, four bathrooms, kitchen and spacious living room the house offers enough space for up to 8 persons. The villa’s ground floor includes the living room with fireside (not for use), sofa corner, dining area, Sat-TV and access of the furnished sea view terrace as well as the separate kitchen, which is equipped with stove (gas; one electric ring), oven, refrigerator with freezer compartment, dish washer, toaster and water kettle. 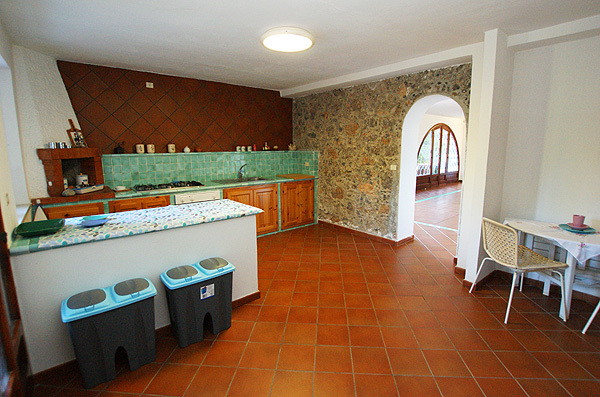 The kitchen opens unto another terrace with dining furniture, masonry grill, pizza oven and outdoor shower. There is a small bathroom with shower cabin next to the kitchen; the washing machine, an ironing board and iron are also found on the ground floor. 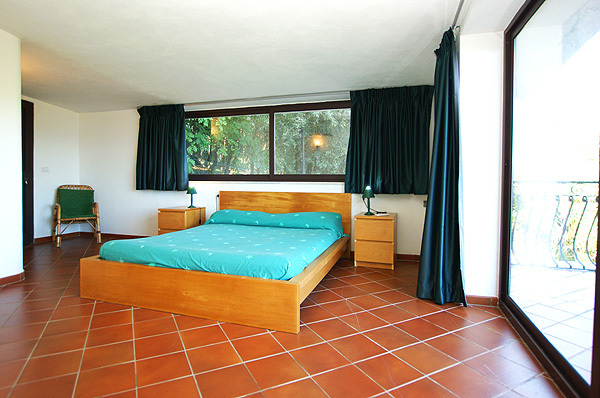 The four bedrooms, each with double bed, are found on the upper floor of the holiday home. 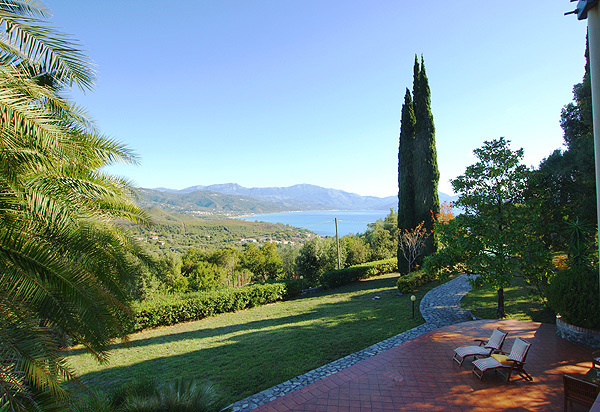 The largest of the four bedrooms faces the Gulf of Policastro, is furnished with air conditioning and has an en-suite bathroom with shower cabin, WC and bidet. 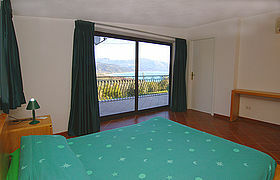 This bedroom and the smaller double across from it offer access of the sea view balcony, which runs the width of the house. 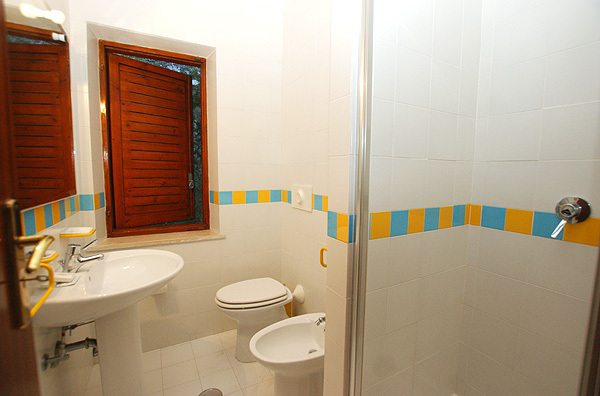 Each of the other two bathrooms on the upper floor is equipped with masonry shower cabin, WC and bidet. 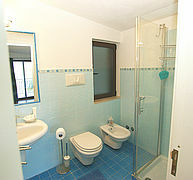 Villa dei Tordi is furnished with gas heating. A children’s cot can be provided. 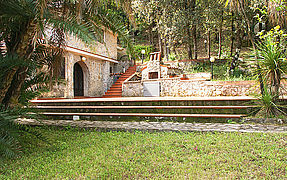 Two to three cars can be parked on the fenced premises. Relaxing on the spacious terrace with sea view and under the tall, impressive palm tree next to the house is easy. Scario’s well-tended lungomare, which is lined by palm trees and at which the lovely church Immacolata is located, is about 900 m from Villa dei Tordi. 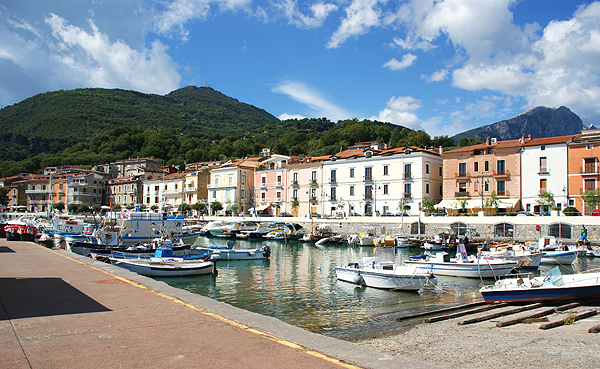 Right alongside the seaside, you find bars, inviting ice cream parlors, restaurants and small stores. A larger supermarket (SIGMA), which is open year-round, is located above the lungomare, right at the access road up to Zona Marcaneto. 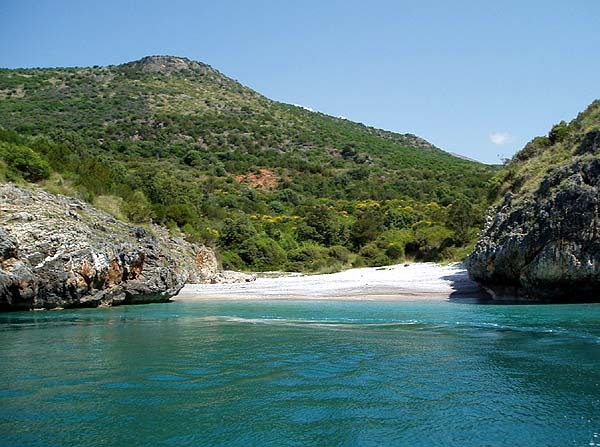 As off Easter, boat trips to the secluded bathing bays between Scario and Baia Infreschi are offered every day. The longer tours, so-called Mini Crociere, take you as far as the Cape of Palinuro. 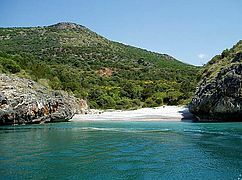 The nice, sandy beaches of Villammare are easy to reach by car. 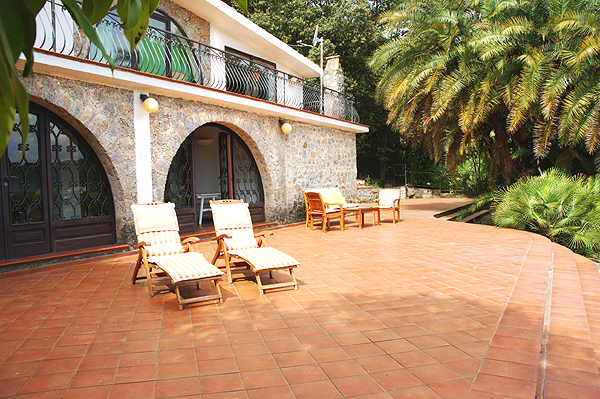 Stately Villa dei Tordi accommodates 8 persons. Enjoy this fantastic panorama every day. 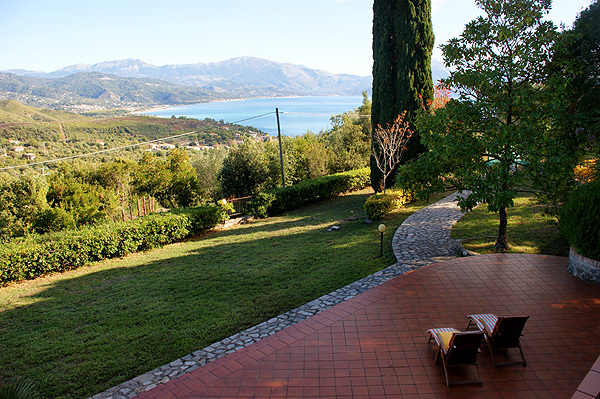 View of the garden and the Gulf of Policastro from the 1st floor balcony. The large French windows open upon a view of the sea and the mountains of the southern Cilento and the Basilicata region. 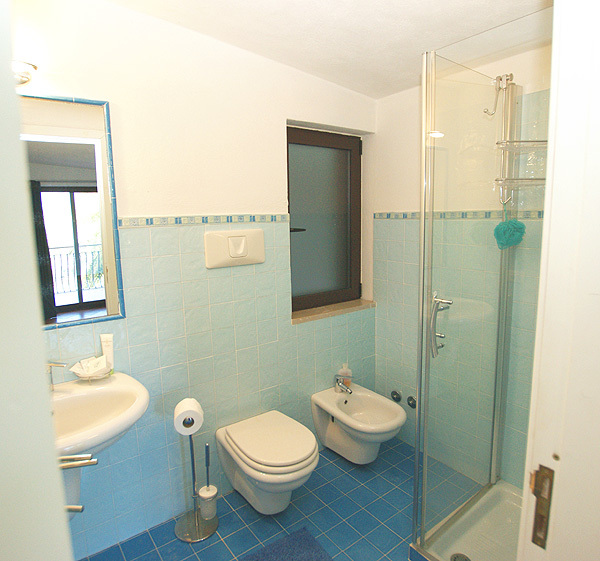 This bedroom has an en-suite bathroom. 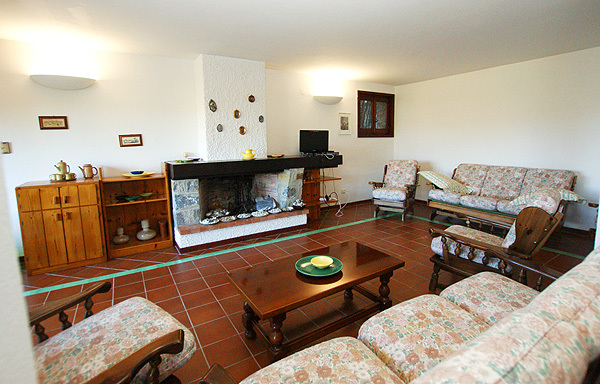 Seats your whole family – the sofa corner with TV. The dining area with large dining table. 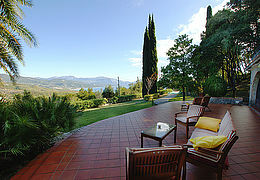 View of the terrace and the garden. 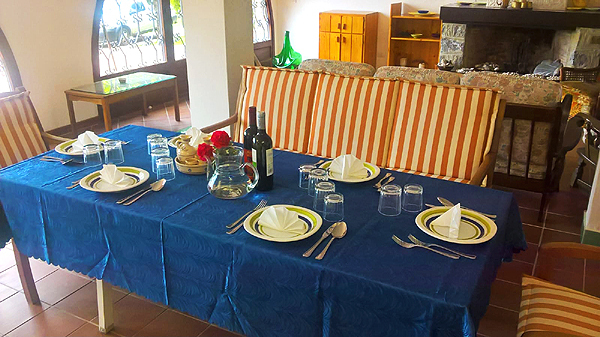 The living room opens onto the furnished sea view terrace in front of the house. 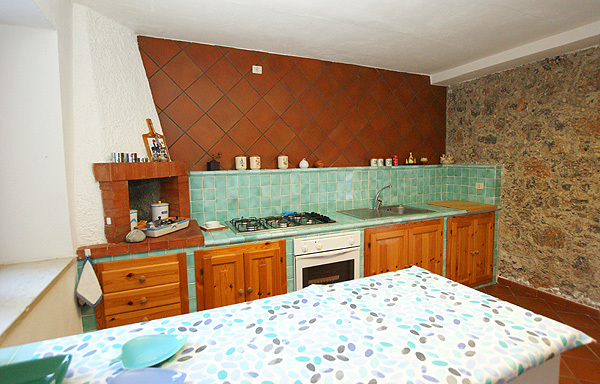 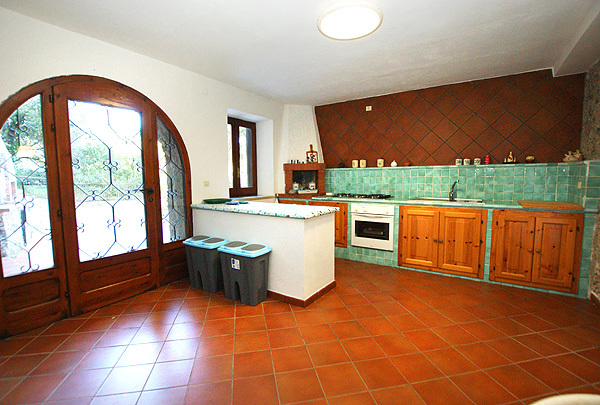 From the kitchen you have access of this terrace with barbecue and pizza oven. 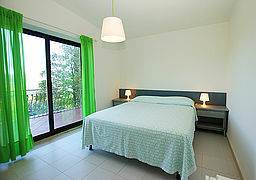 This double bedroom opens onto the 1st floor sea view balcony, too. This double bed can be rearranged into twin beds. The four bedrooms are located on the 1st floor of Villa dei Tordi. 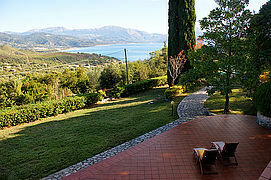 View of the sea from the terrace. Scario’s lungomare is only ca. 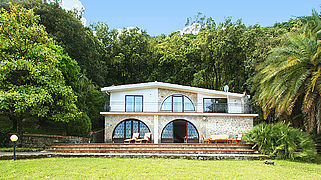 900 m from the villa. A deposit of 200 Euro is due upon arrival (in cash). 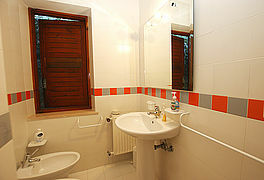 - Heating: charged and to be paid onsite according to use.